Thigh/Leg Holster for big cans of chemical spray. Accommodates gun handle or firemaster nozzle. To make room for your 1 pound OC/Tear Gas Can... how about dropping it to your thigh to keep the belt real estate from overlapping? Adjustable Canister thumb-break...to accommodate a taller can, adjustable ride height and can be set up for either side. IE, its for either right or left hand draw. Shown w/ optional CD-02 Stinger light holder. Click on picture to enlarge. (Securely Velcros in place behind main basket.) The flashlight Holder is available by itself for $10.00. 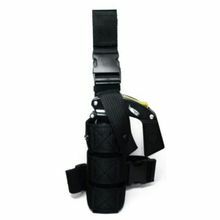 This thigh holster will also accomodate an M18/26 Taser. This rig is as good as the Blackhawk model yet costs much less. Made in America. This is for the holster and rig for your belt, no other hardware is required to carry an MK-9 size pepper spray can on your belt. The pepper spray is not included. Now available is the MK9 holder with molle straps (inset picture). Now you can carry your big can of chemical spray on your molle vest. Just choose from the dropdown menu. This molle version (CDM-08A) cannot carry the flashlight holder.